I recently created an online fundraising appeal to buy solar lamps for students living in Diepsloot who attend the Diepsloot Combined School. Most people in Diepsloot live in shacks made of corrugated metal. Many of these shacks don't have electricity and some have no windows. Some shacks do have electricity but often it's not proper meaning it could be a light bulb hanging from the ceiling and that is it. People in Diepsloot who are fortunate enough to have electricity or fortunate enough to live in actual homes instead of shacks, often don't have electricity because it is unreliable and there are constant outages. Solar lamps will make it possible for students to read and study at night regardless of their electricity situation. Currently many are studying by candlelight. That may have been OK for Abe Lincoln but it's not OK in 2016. The fundraising effort has been extremely successful. Many people who read this blog donated and I am so appreciative! The lamps are going to make a huge difference in the lives of the students who receive them. Students who can read, study and complete homework are going to be better off in life. There is no question in my mind. I like this lamp because it is solar but also has a hand crank so it can always be charged somehow. Yesterday was the day to begin purchasing lamps. 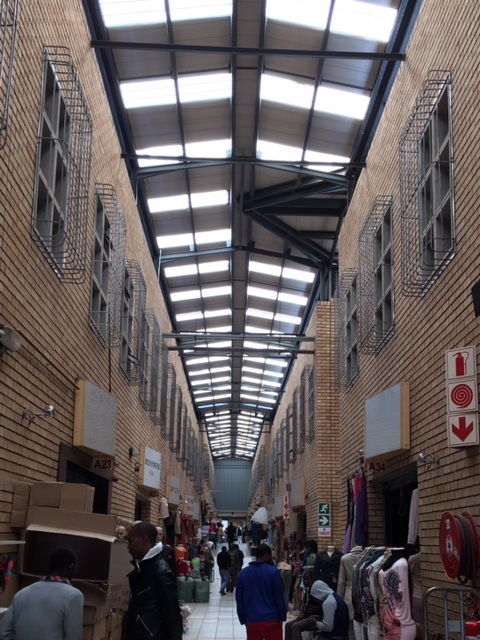 I visited a place called the China Mart located South of Joburg. From what I can tell there are various Chinatowns and Chinese markets (meaning Chinese people selling products produced in China) located throughout the city. I went to the China Mart with my friend and fellow Edu Fun volunteer, Belinda. She is the expert in all things China Mart. 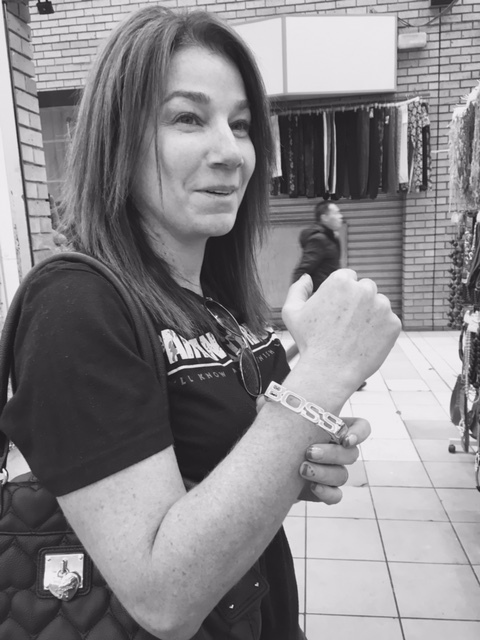 Belinda is American but she has been living in Joburg for years and she knows her way around the China Mart. She is a get stuff done kind of person and she is also volunteer extraordinaire as she supports and helps out many causes. Belinda is also a good price negotiator (I'm not) and thanks to her we got a great price on the lamps. Buying all of the lamps that we need is going to be a multi-step process but the trip to China Mart was a good start and I'll be delivering the first batch of lamps to the Diepsloot Combined School librarian on Monday. China Mart is giant warehouse type building located off the M3 highway. There seem to be numerous buildings in the area selling goods from China. We visited three separate ones but there were others that we didn't visit this time. A few things to note if you are going to China Mart. First, it is cash only. Second, they close at 3:00 p.m. Because it is cash only there are security guys with guns manning the perimeter. I tried to get a photo but it's not like you can ask a guy with a gun to pose for you. Or maybe you can? I didn't try it. As for closing at 3:00, according to Belinda you need to depart by 2:00 or 2:30 latest or you will be stuck in horrible traffic trying to escape with everyone else. I also discovered from Belinda what stock means. If you want to buy six or more of an item you can get a lower stock price. When we arrived, the electricity was out. How ironic! This made the shopping a little challenging because each stall/store was in total darkness. The hallway we walked down was bright due to windows in the ceiling but it was hard to see the inventory inside the stores. Some stores had specific items like clothing or jewelry, others were multipurpose and so went into those asking if they had the lamps. Quite a few did not but then we found one that did. It was dark inside the store but the gentleman working there directed us by shining his laser pointer in the general direction of the lamps. 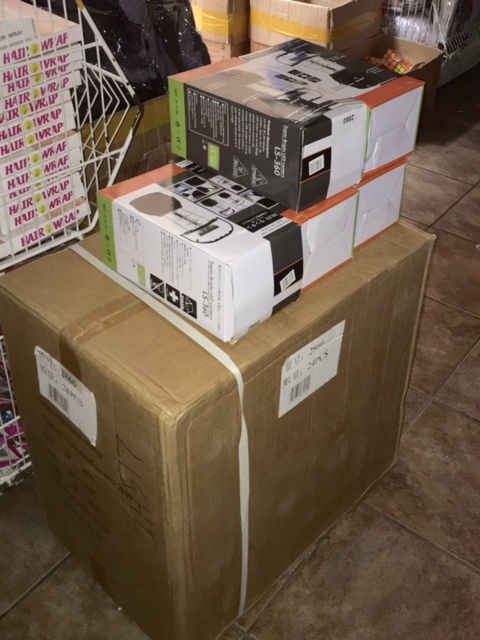 We were able to get 29 lamps for R90 each which was a great deal (thanks to Belinda!) The man is also going to check to see if he has more and he is going to call me today with an update. We then found a few more lamps at another store for R100 so we grabbed those also. After making certain that we had fully investigated the lamp situation, we looked around at some of the other stores. There was a jewelry store which for some reason had full electricity so we spent some time in there. Do you like this bracelet? I didn't buy it. Many people who shop at the China Mart are re-sellers. While we were looking at jewelry a guy came into the store and announced loudly, "I need stuff I can sell to white people." The guy working in the store and I both laughed but the gentleman, who later I found out was named Brian, was completely serious. I offered to help him, being white and all as a focus group of one. We got to talking and I found out Brian is from Zimbabwe and he really wants to visit America. Specifically he wants to visit Philadelphia. I asked him why Philadelphia (not that there's anything wrong with it but as a first choice you must agree it's a little surprising) and he said it's because he had a pen pal from Philadelphia when he was younger. I suggested he try to watch the movie Rocky as the second best thing to actually going to Philly. Holy oil. The photo is blurry but I couldn't not include it. Lots of interesting products for sale! Our last stop of the day was to visit a giant "Sweet Mart" as Belinda needed some things. I have been away from the U.S. for a while now so it's been some time since I was in a Costco or a Target. Sweet Mart was like a Costco only all they sell are items containing sugar. You've tasted Kool-Aid but have you tried Kool U Up? Yum! I almost bought a jar. You can almost see the gun. It is the black shadow to the left of and mostly hidden by the pole. Later in the day I did get photo of a guy with a gun. This was at a petrol station on the way home. 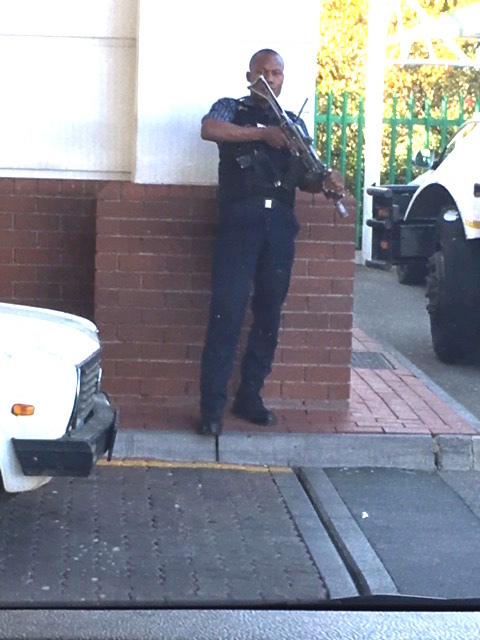 When armored cars are collecting cash from establishments there are always guys guarding with guns so this is a common sight but it's the first time I have been able to get a photo.